Hey - I'm Back!!!! 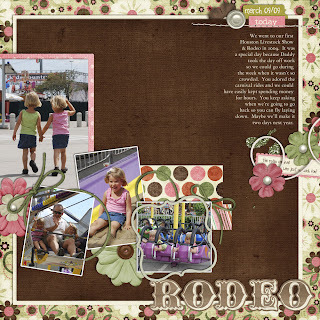 and I have a new goal - one new layout a week until I get caught back up from my year long newsletter editor & scrapbook girl for my mothers of multiples club. The summer has been super busy, and we are just one month away from starting school which is when I really hope to get busy catching up. I also started my own work-at-home business and I have had a few orders here & there, but I really hope to start working in October when people start thinking about Christmas cards. When I bought my new computer and I had to upgrade to Photoshop Elements 7.0 - I'm still adjusting, 5.0 was so easy to use and to load actions & styles. 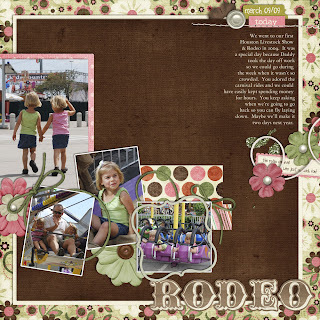 Today I decided that I needed to warm up my scrapbooking muscles again - I had to alter some of the colors in the papers to coordinate better with the girls clothes, but not much else here on the creative side.